one of the most cool pets, and will be one of the most common:/ just do all heroics there is:/ and thats not raids. Seems to me there are some you can buy that are about 800g (if i heard correctly from my sources), and from looking around it seems the bought ones are 280% speed, while the heroic ones move at 310% speed, and the heroic ones are quite, quite hard to get if you read the achievements needed to obtain them. This mount will most likely be slightly less common than nether drakes are today. It won't be hard to get this just time consuming, and many people aren't willing that. I will either be riding this or my black proto-drake as Voruk, Champion of the Frozen Wastes (title for completing all heroic dungeons). It's NOT "just do all the heroics there is"
Some of the achievements actually take some work, and these heroics are, ya know, actually difficult. If you'd like to test drive this, you do get to ride one of these for a quest in grizzly hills. This mount is the reward from completing the "Glory of the hero"
The screenshot is uploaded, waiting for the authentication process to be finished. If anyone wants more screenshots/another screenshot uploaded give me a tell in game. To complete the achievement you will most likely have to have pretty good gear (10man naxx / badge gear atleast), or you will have to spend a lot of time trying. The hardest one for us were "Lockdown!" due to bad luck with getting the right boss. For groups with worse gear or without the right tactics, Volazj's Demise, Gotta Go! and Watch him die! will be very hard. Most others are zergable with pure brute force. Did anyone get a Server First for completing this achievement? I assumed it would be server first worthy and thought our crew was the first group to get the mount. Difficult? I beg to differ :P Original poster was correct, it is already one of the more common mounts. Note:	Achievement reward for completing all Northrend normal difficulty raid achievements. which is also wrong as it comes from achievements on heroic 5man instances; which came from the wow website. like to c u even attempt gotta go pre patch. then u will do it after the nerf and think ur a pro. Also, this is a mount, not a pet. This mount arrives in the mail along with a letter from Alexstrasza as soon as you complete Glory of the Hero. This is the most easily attainable of the proto drakes so far, time-wise that is. I know it sounds stupid considering some people find it just flat-out impossible to do Gotta Go!. You can obtain this mount within a matter of a week, depending on how determined you are. The other protos are either super rare drops (Blue Proto Drake), just a luck of the draw (Green Proto Drake), or require you to have a semi-competent raid/guild (Plagued Proto Drake, Black Proto Drake). Blizzard plans on making Gotta Go! a helluva-lot easier by doubling the requirement time to 4 minutes. That day you will see everyone and their mothers on this mount. Grats to all who already have it (including me)! Many, including myself, will be very glad to hear that this mount is not being removed come 3.1 (as of 3.0.9). No one questions how they fit the giant drake in a mailbox. Not to mention the shipping fees. well dont be silly! 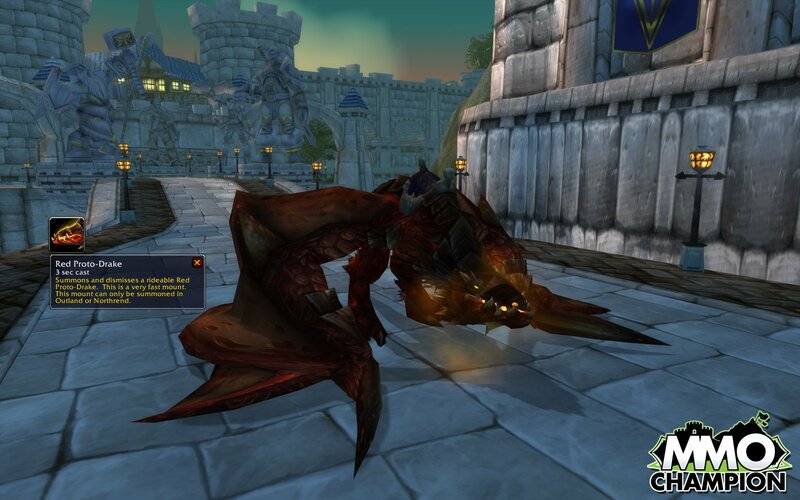 its only the reins of the red proto drake not the actual mount! This is a awsome mount and dosnt take 2 much time at all unless u got noobs in your group. This shouldnt take more then 3 to 4 days max if your group dose it the hardest part is finding a good group believe me. But since i am talking about the hardest part imo its the an and ok achievments partically the an the first boss is a wipe if u dont got the group and the occulas it chalenging but not 2 hard only 1 is achiev where you got to kill the 2nd boss in 20mins for the boss other then that its cake. But it is a cool mount and way worth it although i would recomend to grind the hippogryph from cenarion i have that on my pally and in the new patch 3.3 i think it has a ground animation along with other neet things. Good luck getting this hope thiis helped at all. is this mount able to learn without epic flyght skill? Summons and dismisses a rideable Red Proto-Drake. This is a flying mount. "The vrykul were the first to recognize their potential. Or maybe the second, depending on how you look at it."